The irrigation authorities in Sirsa and Fatehabad have planned strategies to tame the Ghaggar in their districts this monsoon. The districts were among the worst-hit last year with the swollen Ghaggar inundating thousands of acres of land and causing heavy damage to property. Taking a cue from Karnataka, the Indian National Lok Dal (INLD) today sought the sanction of Haryana Governor Jagannath Pahadia to prosecute Chief Minister Bhupinder Singh Hooda for his alleged involvement in a number of land scams. The Bhupinder Singh Hooda-led Congress government in Haryana is under attack from various quarters over its land acquisition policy, converting agricultural land into industrial or commercial property. A local court today awarded four years’ imprisonment along with a fine of Rs 1 lakh to a former HCS officer for the fraudulent allotment of Haryana Urban Development Authority (HUDA) plots to people for extraneous reasons. Haryana IPS officer Manjit Singh Ahlawat was today virtually admonished by the Punjab and Haryana High Court for apparent “Bench-hunting”. Bibipur, a non-descript village in Jind district, has shot into prominence following the village finding a place on the World Wide Web (www). Harmohinder Singh Chatha, Cooperation and Food and Supplies Minister, has said the government would soon launch a campaign to check the sale of cooking gas cylinders on the black market. In a case of corporal punishment, an 11-year-old child was brutally beaten up by a teacher at a private school in Kalanwali town in the district. The timings of all government schools in Gurgaon have been changed with immediate effect. The schools will now open at 8 am instead of 9 am and the classes will be over at 2 pm instead of 3 pm. Labourers working in a factory will now get their wages through banks, Labour and Employment and Information and Public Relations Minister Pt Shiv Charan Lal Sharma said at a function organised by the Labour Welfare Board at Bahadurgarh today. Keshav Gupta of Chawla Colony in Ballabgarh fired at his father in the abdomen and then shot himself. A feud over a trivial issue between two chowkidars led to the murder of one of them on the premises of a local textile factory in Ugrakheri village in the district. According to the police, Tej Bahadur, a resident of Bhojpur village in Nepal, and his brother-in-law Keshav had been working as chowkidars at the factory, which was closed for quite sometime. SS Hooda, Superintending Engineer, Sirsa, today discussed a proposal put forth by his department with Deputy Commissioner Yudhbir Singh Khyalia. Under the proposal, the department plans to invoke the Canal and Drainage Act to stop farmers from setting up their own dams on land along the main creek of the Ghaggar. Another measure includes replacement of cement pipes in the Ghaggar with plastic ones. Hooda said over 400 pipes had been installed by farmers on the entire length of the Ghaggar to siphon off water for irrigation purposes. As many as 85 such pipes with leaking joints had caused breaches in the Ghaggar last year. The department had already served notices to the farmers to replace their pipes with the ones specified by the authorities. Some farmers had encroached upon the main creek of the Ghaggar downstream of Ottu Lake. The irrigation authorities had decided to dig the creek 4 ft deeper at a cost Rs 20 crore to Rs 25 crore, utilising MNREGA funds for the purpose. Meanwhile, the irrigation authorities in Fatehabad have obtained the approval for increasing the capacity of the Rangoi Kharif Channel (RKC) at a cost of Rs 11.98 crore. Satish Ginawa, XEN, said work on it would be started soon. 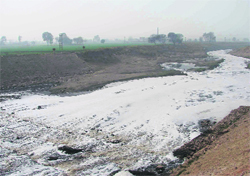 In the second phase, work on the portion of the channel falling in Sirsa would be taken up at a cost of Rs 6 crore. The channel had last year saved Fatehabad town from floods. Hooda said the irrigation authorities in Sirsa wanted that the portion falling in their territory should be taken up first so that it was able to take the increased flow of water from Fatehabad. Hooda said the department would take up this issue at the appropriate level. An INLD delegation, led by its chief Om Prakash Chautala, met Pahadia here and submitted a memorandum to him in this regard. The memorandum said Karnataka Governor Hans Raj Bhardwaj recently sanctioned the prosecution of the Chief Minister of that state for allegedly being involved in a scam of merely 2.5 acres, while in Haryana the land scam involved thousands of acres. It alleged that farmers were being forced to sell their land to a mafia of builders and property dealers. The move of the main opposition party in Haryana is shrewd. Is a Governor bound to seek the advice of his Council of Ministers while deciding the issue of sanction to prosecute or not? This issue was decided by a Constitutional Bench of the Supreme Court in 2004 in a Madhya Pradesh case. The then Governor of Madhya Pradesh, Bhai Mahavir, a BJP appointee, had sanctioned the prosecution of two ministers in the Digvijay Singh-led Congress Government. The matter went to the Supreme Court. The apex court held that such issues were to be decided by the Governor by applying his own mind. He was not to act on the advice of his Council of Ministers. When Bhardwaj accorded sanction to prosecute the Karnataka Chief Minister, he was well aware that the law was on his side. In Haryana, the Governor is highly unlikely to accept the INLD request. Pahadia has been a Congress man to the core of his heart. He is an appointee of the Congress-led Central Government. He will not act in haste. A source in the Raj Bhawan said it was too premature to say anything on the issue because the Governor would have to go in detail into the allegations levelled in the memorandum to check their veracity. It is not that the INLD is not aware of the ground realities. The party hopes that the issue would give it publicity. Already Congress spokesman Ved Prakash Vidrohi has described the memorandum as a “publicity gimmick”. What if a Governor just sits over a request for sanction to prosecute? There is no judicial remedy. This was also decided by the Supreme Court in the Mayawati case where the then UP Governor was taking his own time in deciding a similar request. The apex court held that it had no power to issue a writ of mandamus to the Governor. The Punjab and Haryana High Court has pulled up the Hooda regime for “shady” land deals in several instances. Farmers in different parts of the state are up in arms over the issue. The farmers’ protests against the acquisition of their fertile land are spread across Gurgaon, Nuh (Mewat), Rohtak and Fatehabad districts. While the farmers of Pachgaon (Gurgaon), Rohtak and Gorakhpur (Fatehabad) have been opposing the acquisition of their fertile land, those in Nuh have been demanding higher compensation for the land acquired by the government or its agencies. The Opposition is trying to make the most of the situation. The INLD has already announced a statewide agitation against the “pro-builder and anti-farmer” stance of the government. It has decided to gherao Parliament and corner the Hooda regime on the issue during the coming assembly session. The farmers opposing the government move point out that while the central Congress leadership (read Sonia and Rahul Gandhi) have publicly opposed the acquisition of fertile land for commercial use, the Hooda regime in the state has initiated the process to acquire fertile land for exactly that purpose. Then there is the issue of several industrial plots lying vacant in the state IMTs with the industrialists keeping these for investment purposes even as the state continues to acquire thousands of acres of agricultural land, which may hit foodgrain security in the long run. In 1969, nearly 80 acres of land in Sukhrali village (opposite MDI) was acquired for industrial purposes. In the HUDA masterplan of 1977, a piece of land measuring 12.88 acres was changed into public utility but now, it has been converted into commercial use. “We have learnt that this land has been given to Brahma Center Development Pvt Ltd 1507-9, Narain Manzil, 23 Barakhamba Road, New Delhi, for building a commercial complex at a throwaway price of Rs 660 crore, despite the fact that in the HUDA masterplan this land is meant for public utility. The actual market price of this land is Rs 1,960 crore,” said RS Rathee, president, Gurgaon Citizens Council, at a press conference here today. In a letter to the Chief Minister, the Federation of Residents Welfare Associations (FORWA) and the Gurgaon Citizens Council have demanded that the deal be cancelled. The HCS officer, Deveshwar Dayal, was the City Magistrate of the district in 2001-02 and he held the additional charge of Estate Officer, HUDA. On August 28, 2002, the then EO of HUDA, Harish Bhatia, had lodged an FIR with the police alleging that between May 29, 2001, and January 10, 2002, Deveshwar Dayal and eight other officials of HUDA had committed a fraud with the government. He maintained that the accused did not register some plots of HUDA in the official records and sold those for money. The police had registered a case under Sections 409, 420, 467 and 468 of the IPC. Prior to the registration of the FIR, senior officers of HUDA had conducted an inquiry into the case. Deciding the over-eight-year-old case today, Additional District and Sessions Judge JS Kundu awarded four years’ imprisonment to Dayal. The court sentenced his accomplices, Babloo and Mohan Lal, to imprisonment of three years each along with a fine of Rs 40,000 each. Three other accused were sentenced to one-year imprisonment along with a fine of Rs 20,000 each in the case. Taking up Ahlawat’s application for posting before some other Bench judicial officer MM Dhonchak’s petition against him, Justice Ranjit Singh described the action as “unfortunate”. In his crisp one-page order, Justice Ranjit Singh said: “It is unfortunate to notice that the application is filed for not hearing the case on the ground that the case of complaint of the judicial officer was placed before a committee, where the Judge hearing the case was a member. “It appears that the application is only to get this case out of this Bench. It may be termed as Bench-hunting. Once the respondent (Ahlawat) has expressed certain apprehensions, this court would not like to hear this case. “Let the case be placed before some other Bench after obtaining appropriate orders from the Chief Justice”. Ahlawat, in his application, had earlier sought the posting of the matter before a Bench which was not part of the disciplinary committee that submitted its report on September 10, 2009. In the report, it was clearly stated that there was some friction between the applicant and Dhonchak, when they were posted at Rewari. Recommending the dropping of the proceedings against the judicial officer, the committee had concluded that the same were "based on circumstances, which were manipulated against him". Dhonchak had initially requested for a CBI probe against the applicant and others. In a letter, Dhonchak had sought a probe into the allegations of forgery and fraud against Ahlawat during his tenure as SP, Rewari, along with other police officials. This small village, a part of one of the backward regions of the state, is now accessible on the Net and can be visited online anywhere in the world. The village has set an example in the matter of e-governance, a concept launched in the recent past to promote transparency in the administration and in public matters. The village has achieved the milestone without any official support. functioning of the village panchayat. The village, which falls on the Jind- Bhiwani road, about 11 km from here, has its own website (www.bibipur.com) which contains all the relevant information about the village, says Sunil Kumar, the brain behind the project. Anyone can now access information about the village and the works done by it, he adds. He claimed that it was the first village to have put information pertaining to various projects like the job scheme, the voters’ list, the BPL card-holders’ list, decisions taken by the panchayat at its meetings and the progress of various works. Armed with an MSc in maths and MEd, Sunil worked on creating a website of the village after he became the sarpanch. “Since I had done my graduation in computer science, the idea of setting up a website of the village came to my mind and I started working on it,” he said, adding that the concept of e- governance had been started by the state government and “I wanted to bring it to the village to ensure transparency at the local level”. The website has already attracted over 6,300 visitors. Talking to mediapersons here today, he said if any employee of any gas agency was found involved in the illegal sale of cylinders, the dealer of the gas agency would be held responsible for it. He said various hotels, dhabas and other commercial establishments had been using domestic gas cylinders for commercial purposes, which was illegal. He said officers of the department had been directed to conduct raids on hotels and dhabas to check the misuse of domestic cooking gas. The teacher thrashed Ritik, a student of Class V of Evergreen Royal DAV Public School, as he had failed to do his homework three days ago. His father Krishan Kumar alleged in his complaint to the police that his son’s teacher, a woman, handed over Ritik to another teacher Surjit Singh to teach him a lesson. He alleged that the teacher beat up Ritik mercilessly with a stick. However, Ritik did not reveal the incident at home. Krishan Kumar said Ritik had revealed the details when his family members noticed the injury marks today and asked him about it. Ritik told the police that he had failed to do six questions of mathematics given as homework by the teacher, who then handed him over to Surjit Singh to beat him up. Later, the police summoned the teacher to the police station, where the matter was resolved after Surjit Singh apologised for his act. School Principal Manju Jain could not be contacted for comments. Surjit Singh, however, admitted his fault and said parents themselves ask them to deal sternly with their children. He said the matter had ended and he had apologised before Ritik’s father. This was stated by the District Education Officer (DEO), Jyoti Chaudhary, here today. She said the school timings had been changed following directions from the Director of School Education, Haryana, in this regard. The DEO further disclosed that a local holiday would be observed on February 16 in all government schools of the district on account of the Eid-e-Milad festival on that day. Earlier, the local holiday had been fixed for October 27. He said this measure was in the interest of both workers and industrialists as it would eliminate the possibility of any irregularity in the disbursement of wages. “The accounts of the workers will be got opened by the factory owners who would have to put up a signboard on their premises, showing the facilities given to the workers as laid down by the Labour Welfare Board. “This would enable the workers to get information about their rights and the facilities being offered by the board,” said the minister. He said an ESI hospital would be opened at Bahadurgarh exclusively for the workers. Sharma said farmers and workers had an important role in nation-building. Hence, the ties between the labour and management should be cordial. The industrialists should protect the interests of the workers. They should be paid on time and attention should be paid on their safety at workplace. Terming child and bonded labour as a social evil, he underscored the need to bring about social awakening to counter it. The Labour Welfare Board was implementing several welfare schemes, including scholarship for wards of workers. Sharma said the board had spent Rs 8.30 crore on various schemes benefiting 13,847 workers. As many as 10 labour welfare centres were being run by the board to impart training to the wards of workers in tailoring, embroidery as well as technical work. The minister distributed bicycles among the workers on the occasion.